We’ve said it before and we’ll say it again – ADE is huge. 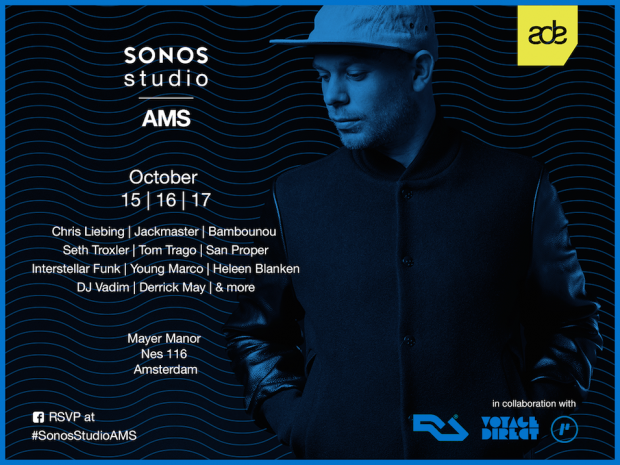 Sonos is one of the companies that returns to ADE this year with three amazing day and night events at the Mayer Manor. Sonos Studios has created an intimate playground where there’s room for experimentation and where artists and music lovers can create a deeper connection by sharing their obsessions and ideas. Through unique listening experiences, parties, performances, screenings and conversations Sonos will make sure you’ll hear music exactly as it was intended to be heard. This Thursday Sonos will pay homage to a handful of originators who’ve played a role in shaping modern electronic music. At daytime Derrick May, DJ Vadim and Osunlade will inspire you with their words. Derrick May is a true pioneer, but when he started making music he merely saw it as an expression of life and had no expectations whatsoever. And he still doesn’t, how modest is that? I’m sure that you danced to Onsulande’s mega hit Envision in 2011. After these talks and listening sessions Sonos has invited artists that have featured in the Origins film series they created with Resident Advisor. Chris Liebing, Jackmaster, Black Coffee, DVS1, Eats Everything and Bambounou will hit the decks to articulate their individual musical journeys. DVS1 is our favorite of the series, and Black Russian on the background just gives us chills. On Friday Sonos will celebrate the sound of Amsterdam with Tom Trago’s Voyage Direct. His label has been one of the local leading labels since 2006. Tom has recently started his own agency as well, Voyage Select. His First Mission compilation is rocking and he toured through Europe to celebrate. Tom and his label mates will dive into their influences and discuss the rise of a new generation of producers in both words and music. Tom and Elias Mazian will discuss the Amsterdam sound during the day and at night Aardvarck, Awanto3, William Kouam Djoko, Interstellar Funk, Maxi Mill and San Proper will join them for b2b sessions that will showcase their sound, past, present and future. Saturday’s program will be presented in partnership with Pause and Mixcloud. This day will be all about about the art of music discovery. The day program consists of a panel discussion with special guests that are experts in exploration: Seth Troxler, Jameszoo, Marcus Worgull and DJ Solar. In the evening Young Marco​, ​Chee Shimizu​ and Heleen Blanken will perform and present to you their musical treasures. We can’t wait for Young Marco, his taste in music is exquisite and he always knows how to surprise with interesting tunes. Just have a listen at his mesmerizing Boiler Room set in Trouw. And Heleen Blanken didn’t tour with Ben Klock with her visuals without a reason… Just saying. To stay up to date make sure to attend on the ​Sonos Studio event page, this is where you can sign up as well! See you there party people. Feature image by Jesaja Hizkia.